Vietnam values its comprehensive partnership with the US and considers the country an important partner in its foreign diplomacy, President Tran Dai Quang said. He made the remark while receiving Senator Cory Gardner, Chairman of the US Senate’s Foreign Relations Subcommittee on East Asia, the Pacific, and International Cybersecurity Policy, in Hanoi on May 28. Praising his guest’s contributions to the US’s relations with the region in general and Vietnam in particular for peace, stability, cooperation and development, the leader expected the senator to continue helping the ties to grow. President Quang expressed his delight at upbeat improvement of Vietnam – US comprehensive partnership across all fields as reflected through talks and meetings between their high-ranking leaders. 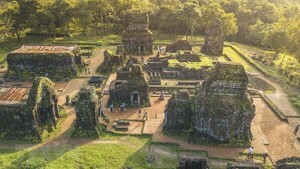 He specifically pointed to a State visit to Vietnam by President Donald Trump and an official visit to the US by Prime Minister Nguyen Xuan Phuc last year. The State leader lauded positive growth of bilateral parliamentary ties and stressed that Vietnam welcomes visits of more US congressmen who seek to explore Vietnam’s culture, land and people and will serve as a bridge for Vietnam – US cooperation. He suggested the US side carry out measures to increase exports to the Vietnamese market in a bid to improve their trade balance, and clear trade barriers to facilitate the entry of Vietnamese goods into its market. He recommended the two nations extend their mutual consultations and information exchange at international and regional forums and within the UN framework, especially on issues of shared concern. 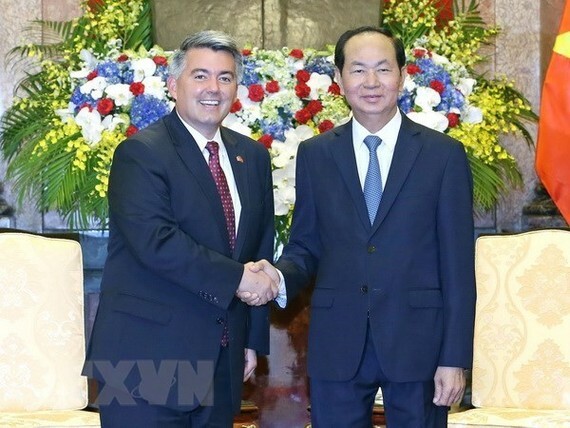 For his part, Cory Gardner informed his guest that during his visit, he planned to have working sessions with Vietnamese agencies to discuss boosters to Vietnam – US ties. He commended Vietnam’s stance on ensuring peace, security and freedom of navigation and overflight in the East Sea. As the US Senator of Colorado, he introduced his state’s strength in environmental sector and expressed his willingness to bridge cooperation between Colorado and Vietnam in environmental protection and climate change response. He said he supports free trade and increasing Vietnam – US collaboration in mitigating Agent Orange impacts and clearing post-war bombs and mines.